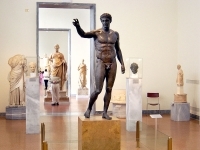 This is the largest and most popular of Athens' many museums, and is usually very crowded. Its vast collection includes treasures unearthed from Mycenae by Heinrich Schliemann; a staggering array of sculpture including the earliest known Greek figurines dating from around 2000 BC; frescoes from the volcanic island of Santorini; and so much more that it is recommended visitors make several visits to absorb it all. One of the most popular displays is the Mycenae gold, collected from ancient tombs, including Agamemnon's death mask. The museum is world-class and well-arranged and it hosts regular temporary exhibitions and educational programmes (lectures and workshops) for those interested. There is a gift shop and cafe for visitors to relax in if they get tired, which is often necessary as the museum can occupy one for hours and there is not much seating in the exhibition rooms. Photography is allowed in the museum and the glass display cases have been designed to make photography possible. There is a disabled entrance around the side of the building. By all accounts this is one of the most captivating and impressive museums in the world and it is a must on any visit to Athens. Opening times: Monday 1pm to 8pm. Tuesday to Sunday 9am to 4pm. Closed on some national holidays. Admission: €15 (adults); €8 (concessions). From November to March, Sundays are free.